Phil Block, M.S., & L. Kravitz, Ph.D.
Techniques of exercise periodization for developing muscular fitness have been made popular by a growing body of research (Fleck, 1999). Studies consistently demonstrate that periodization programs are among the most effective muscle strengthening exercise protocols that exist (Fleck, 1999). Although there is no single best periodization program that suits everyone due to individual differences such as gender, muscle fiber percentages, and genetics, undulating periodization programs have recently shown particular promise for optimizing muscular fitness benefits (Marx et al., 2001). It is hypothesized that distinctive training variations and modulation of the exercise stress and recovery patterns may lead to greater muscular adaptations in undulating periodization programs compared to more traditional approaches (Overturf & Kravitz, 2002). Most recently a unique opportunity for establishing a nutritional framework to support periodization programming has been suggested (Coyle, 2004). This dietary approach is referred to as nutrient periodization and focuses on adjusting the macronutrients to best support exercise periodization techniques. The rationale and implementation of this new training application is presented and discussed in this article. Whats the basis of nutrient periodization? Nutrient periodization is a robust system of fluctuating macronutrient (carbohydrate, fat, and protein) intake that works in concert with the most current exercise and nutrition research for muscle strength and hypertrophy. In addition, it is supported and driven by the recent 2005 Dietary Guidelines for Americans (HHS & USDA, 2005). Thus, it is a balanced dietary program that fitness trainers, their clients, and scientists can all embrace. How is nutrient periodization grounded in solid nutrition guidelines? In 2002, the Institute of Medicine Food & Nutrition Board established new dietary guidelines for macronutrient consumption called the Acceptable Macronutrient Distribution Range (AMDR). The AMDRs define the appropriate average ranges for dietary intake of carbohydrate, fat, and protein. These guidelines were designed to avoid nutrient deficiencies that seem to occur when macronutrient consumption consistently falls above or below the recommended levels. The AMDR recommendations have been incorporated into the 2005 Dietary Guidelines for Americans and advocate 45 and 65 percent of their total kilocalories from carbohydrates, 20 to 35 percent from fat, and 10-35 percent from protein. The AMDRs allow for the dietary individualism that is necessary for meeting specific exercise goals, such as for building muscle and increasing muscular strength. How do individuals interested in muscle hypertrophy benefit from this? Athletes and serious exercise enthusiasts often engage in extreme intakes of protein, carbohydrate, or fat, while de-emphasizing other macronutrients at the same time. Although there may be a need to increase a particular macronutrient acutely, chronic unbalanced dietary practices may result in decreased performance, loss of muscle, and overall fatigue. Elevated protein intake (a common practice for building muscle as it results in maintained positive nitrogen balance) may decrease fat and carbohydrate consumption to levels that hinder performance and ultimately inhibit optimal muscle growth. Conversely, high carbohydrate diets (a necessity for recovery from intense training bouts) may edge out fat and protein, which has an entirely different repercussion, namely altered cholesterol profiles (American College of Sports Medicine, American Dietetic Association, and Dietitians of Canada, 2000), depressed testosterone levels (Lambert et al., 2004), and overtraining (Venkatraman and Pendergast, 2002). This will ultimately lead to the inability to gain muscle mass. Therefore, nutrient periodization is a sensible practice for serious exercisers because it can modulate macronutrient intakes while reducing the chance of nutrient deficiencies over an extended period of time. It works by promoting a day-to-day fluctuation of macronutrient intake to match the exercise periodization needs for building muscle and gaining strength. It is important to note that because the AMDR recommendations give guidelines for average intakes, individual days can be below or above those recommendations. As long as the diet falls within those guidelines over the course of several days or a week, nutrient deficiency and disease risk will be low. Why is kilocalorie intake important for building muscle and gaining strength? Physiologically, the key to gaining muscle mass is to consume more energy than what is expended, while focusing on high-intensity resistance training (Lambert et al., 2004). Nutritionists and other health professionals have long understood the importance of tipping the energy scales in favor of excess kilocalorie consumption for muscle gain. Although this view may be criticized for being overly simplistic and sometimes ineffective, energy intake is usually considered a critical strategy for muscle gain. The exact amount of excess kilocalories required to gain muscle is not clearly known, as the effects of metabolism, exercise, and nutrient status make pinpointing specific requirements difficult. Experts, however, recommend between 1000-3500 excess kilocalories over the course of a week to gain one pound of muscle. This number is based on several overfeeding studies and estimates of muscle gain (Manore & Thompson, 2000). In real-world situations, hypertrophy may require higher levels of kilocalorie intake than this recommendation, with research suggesting approximately 44 to 50 kcal/kg body weight/day (Manore, Thompson & Russo, 1993). Some persons completing serious training may have even higher energy requirements. Based on this research, a 100 kg (220 pounds) individual attempting to build muscle might have a kilocalorie requirement of 4400-5000 kilocalorie a day or greater. So, how many kilocalories should be consumed to build muscle? The bottom line is increased kilocalorie consumption is necessary to build muscle. From the review of literature, a suggestion of at least 47 kcal/kg of body weight/day may be recommended, realizing that factors such as individual metabolism may bring that number higher or lower. Why is protein intake important for building muscle and developing strength? When an individual is resistance training (particularly heavy resistance training), there is an increase in the rates of both protein synthesis and in the breakdown of protein in muscle for at least 24 hours after a workout. Additional protein may be needed to, 1) help repair exercise-induced damage to muscle fibers, 2) promote training-induced adaptations in muscle fibers, and 3) assist with the replenishment of depleted energy stores (Gibala, 2004). Optimal protein and amino acid ingestion is regarded as crucial for strength and hypertrophy. Individuals who consistently engage in moderate to high levels of exercise should consider a protein intake that exceeds the U.S. Dietary Reference Intake (DRI) of 0.8 g/kg/day (Lambert et al., 2004). However, in a recent review, Tipton and Wolfe (2004) state that there is confusion in the research as to what optimal protein intake is because the level of optimal protein intake in athletes is very different for varying activities and individual goals. For example, a strength athlete requires sufficient protein to maintain and gain muscle mass, while an endurance athlete is more concerned with simply maintaining muscle mass while improving performance. This requires the adjustment of protein recommendations to specific levels that have not yet been adequately researched. According to a most recent position stand on nutrition and athletic performance, experienced male bodybuilders and strength athletes may consume 1.6 to 1.7 g/kg/day to allow for the accumulation and maintenance of lean tissue (American College of Sports Medicine, American Dietetic Association, and Dietitians of Canada, 2000). Data on female strength athletes is not available, but there is no evidence to suggest that this level will not sufficiently meet the dietary requirements of female athletes as well. Interestingly the impact of carbohydrate and fat on protein metabolism is a topic of current interest, with investigations suggesting there are anabolic concomitant effects of carbohydrate and fat on protein balance (Miller, Tipton, Chinkes, Wolf, & Wolfe 2003). Current research on protein intake for building muscle indicates that higher levels of protein may drive muscle metabolism toward hypertrophy, and so the suggestion for muscle-building is to maintain a high protein intake within the current guidelines (Lambert et. al, 2004). A protein intake of 1.7 g/kg/day should optimally meet an exercisers muscle fitness gains. Why is carbohydrate intake important for building muscle? Varying exercise intensity is a key strategy to optimally building muscle. The current theory on the effectiveness of periodization programs is that very intense workouts will stress different muscle fibers than less intense workouts. This means that during an intense workout, certain muscle fibers will be activated while other fibers rest. Purportedly, alternating cycles of high-volume, low-intensity with low-volume, high-intensity provides a satisfactory stimulus/recovery for the different types of muscle fibers in the human body and minimizes the risk of overtraining (Overturf & Kravitz, 2002). Stored carbohydrate (glycogen) is the predominant fuel source for moderate to high intensity activities. High intensity exercise takes a particular toll on glycogen stores because the availability of fat for fuel becomes limited at higher exercise intensities. When muscle glycogen stores are diminished, fatigue is eminent. The replenishment of depleted muscle glycogen stores is of utmost importance to athletes and other very active people. If the stores are not recovered, the ability to exercise at a given intensity is greatly diminished, possibly leading to a detraining of the muscle (Burke, Kiens, & Ivy, 2004). When building muscle, especially through a periodization program, this is an important consideration because inadequate glycogen stores will decrease the exercisers ability to maintain appropriate exercise intensities. Resistance exercise may be particularly affected by decreased glycogen stores. Some research suggests drops of between 25-40% in total muscle glycogen during multiple-set resistance exercise to fatigue (Tesch et al., 1998). How much carbohydrate should be consumed to build muscle? Most active people report a diet of about 45-50% carbohydrate (about 5 grams carbohydrate/kg/body weight/day), which can easily support moderate bouts of exercise of about one hour per day (Hawley et al., 1995). Current literature recommends using absolute values of carbohydrate intake (g/kg) in reference to making recommendations for intake for adequate levels of glycogen replenishment from exercise. The recommendation is that athletes and recreational exercise enthusiasts seeking to maintain higher carbohydrate diets achieve a carbohydrate intake between 7-12 g/kg of body weight/day when attempting to restore glycogen stores after an intense workout (Coyle, 2004). This recommendation targets endurance exercise, but translates to prolonged, high intensity resistance workouts as well. The problem with this practice is a long-term high-carbohydrate diet may elevate serum triglyceride and interfere with muscle building by decreasing fat and protein intake. Coyle (2004) proposes that a carbohydrate periodization approach bests resolves the long-term consequences of a diet too high in carbohydrates, yet meets the demands of the serious exerciser. The idea is that not every day of training requires a high intake of carbohydrate since not all days of exercise are intense or prolonged. Dr. Coyle (2004) writes, Unfortunately, there has been little investigation of how best to vary carbohydrate intake on a day-to-day basis to match the typical alteration of hard, easy, and moderate days of training performed during a week by well-coached competitive athletes. It is assumed that the most important objective of periodization of daily carbohydrate intake would be to ensure high muscle glycogen levels at the start of the hard training sessions. Serious exercise enthusiasts often perform 2-4 'hard' training sessions per week. To raise muscle glycogen to high levels, these exercisers should eat a total of 7-12 grams of carbohydrate/kg body weight during recovery from the last training session. The recovery period should be not be less than 24 hours (Burke, Kiens, & Ivy, 2004). However, during the 24 hours prior to a moderate or easy day of training, it may be satisfactory for serious exercisers to eat 5-7 grams of carbohydrate/kg. This nutrient periodization technique optimally accommodates macronutrient needs to the intensity fluctuations of periodized exercise programs. A carbohydrate periodization plan for building muscle and increasing muscular strength? Consider the following application from the research. After an intense workout, carbohydrate stores should be restored with a carbohydrate intake of 7-12 g/kg/day of carbohydrate (Coyle, 2004). Since most individuals trying to build muscle are not necessarily engaging in prolonged intense activity, it may be unnecessary to replenish with the upper end of the carbohydrate intake recommendation (12 g/kg/day) and thus achieve a more favorable macronutrient balance with a moderate approach. Therefore, an intake of 9 g/kg/day of carbohydrate for 24 hours following an intense workout may be ideal for individuals attempting to maximize muscular fitness gains. Further, after the carbohydrate stores have been replenished, high carbohydrate intake is no longer necessary focus and the exercisers can focus on the other macronutrients. During the 24-hour period prior to a moderate or light intensity activity, the fitness enthusiast attempting to build muscle may consider an intake of 6 g/kg/day of carbohydrate. Is fat intake important for building muscle? Fat is an essential nutrient in the human diet. In addition to providing energy, it is responsible for the transport of vitamins A, D, and E. Fat is also contained in every cell in the human body as a component of the cell membrane. If fat intake is too low, blood lipid profiles are affected, and various negative health and performance consequences may occur (Dreon et al., 1999). Since no sports performance-related benefits are associated with fat intakes below 15% (and health concerns would exist), experts do not recommend fat intakes below 15% of the total energy requirement (American College of Sports Medicine, American Dietetic Association, and Dietitians of Canada, 2000). Fat is an energy-dense substance, providing approximately 9 kcal/gram of energy. This makes the macronutrient a prime choice of foodstuff for recreational athletes building muscle. Healthful fat is an essential macronutrient for individuals attempting to maintain the high kilocalorie dietary needs of vigorous exercise for building muscle. Some of the most exciting research on fat intake has examined its suspected contribution to minimizing the effects of overtraining. Overtraining is a major concern in exercise, as it severely diminishes the success of a fitness program. The use of Omega 3 Polyunsaturated Fatty Acids has been recently advocated as being a possibly effective way of reducing overtraining symptoms (Venkatraman and Pendergast, 2002). How much fat is needed to build muscle increase muscular strength? The current dietary recommendations for fat intake in the general public are to maintain fat intakes of between 20-35% of the total energy intake. This should be divided fairly evenly among saturated, polyunsaturated, and monounsaturated fatty acids. Chronic low fat diets (<15%) should be avoided because it may make it difficult for an exerciser to achieve a high kilocalorie diet, result in overtraining, negatively affect the lipid profile, and/or decrease exercise performance (Venkatraman and Pendergast, 2002). Chronic high fat diets (>35%) should be avoided because they may reduce carbohydrate and protein consumption, decrease long-term performance, reduce fat-soluble vitamin intake, and potentially increase the risk for cardiovascular complications (American College of Sports Medicine, American Dietetic Association, and Dietitians of Canada, 2000). With the nutrient periodization approach to training, the suggestion is to allow fat intake to fill in the kilocalories after protein and carbohydrate levels have been established. When nutrient periodizing, carbohydrate levels after intense workouts will be high, so fat intake will be correspondingly low. When carbohydrate intake is low (prior to moderate or low intensity workouts), fat intake will be much higher, compensating for the low-fat intake days. In effect, this technique will moderate fat intake while allowing optimal fluctuations of carbohydrate. Figure 1 depicts a sample nutrient periodization program for a 100 kg (200 pound) individual seeking to optimize muscle mass, while following the undulating periodization program initially shown in Figure 1. Relative macronutrient percentages fluctuate with exercise intensity to adequately facilitate recovery. Total kilocalorie intake for the exerciser is 4700 kilocalories/day (47 kilocalories/kg/day). Protein intake is maintained at 1.7 g/kg/day as the research does not yet support periodization of this nutrient. Carbohydrate intake changes from 6-9 g/kg/day depending on the intensity of the associated workout and fat intake adjusts to the carbohydrate and protein intake. 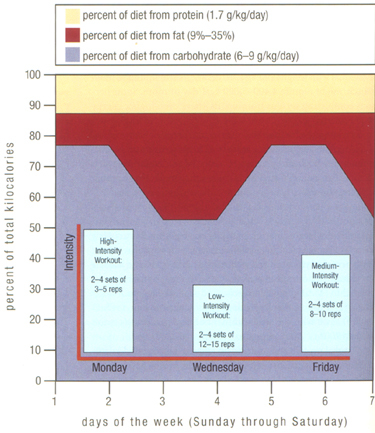 Note that although on a day-to-day basis, macronutrient percentages fall outside the AMDR recommendations, over the course of the week the macronutrients are moderated. Fat intake averages ~20%, protein ~14%, and carbohydrate averages between 65-66%. In effect, the recommendations for carbohydrate replenishment from intense workouts are met, while also meeting the nutritional values from the Dietary Guidelines for Americans 2005. This presents a sensible, balanced approach for nutrition and periodization for building muscle. Exercise periodization is a widely-used technique for optimizing muscle fitness benefits. Using an integrated approach of periodization-supportive nutrition is an evidence-based approach to maximizing these benefits. Carbohydrate consumption is important to any activity, but it is particularly critical for intense workouts. Since periodization programs allow individuals to maximize intense workouts by designating the appropriate activity-to-rest fluctuation to allow optimal growth and recovery of muscle tissue, carbohydrate periodization is an attractive macronutrient approach to compliment the periodization program. For building muscle, a carbohydrate cycle of 6-9 g/kg/day should be developed around a particular periodization program. The available protein research demonstrates the potential significance of elevated protein intake for building muscle. Current recommendations suggest that high protein intake may optimize muscle growth, so individuals seeking muscle growth and strength gains should consider maintaining protein intakes at toward the upper-end of the protein intake recommendations (1.6-1.7 g/kg/day). Lastly, fat intake should be periodized in relationship to carbohydrate and protein intake to achieve the best results for building muscle and increasing strength on a periodized exercise program. Of course, choosing healthful fats is always recommended for long-term health benefits. The literature indicates that appropriate nutrition aids muscle growth, recovery, and development. Periodization-supportive nutrition, or nutrient periodization, makes intuitive and research-backed sense and is a very creative and innovative approach to training. Phil Block, MS, is a doctoral student in the exercise science program at the University of New Mexico, Albuquerque (UNMA). He earned his masters degree in nutrition and dietetics in 2001 and has research interests in the field of applied sports nutrition. He currently works as a personal trainer and health educator at Sandia National Laboratories, and as a university lecturer in nutrition. Len Kravitz, PhD, is the coordinator of exercise science and a researcher at UNMA, where he won the 2004 Outstanding Teacher of the Year Award. American College of Sports Medicine, American Dietetic Association, and Dietitians of Canada (2000). Joint Position Statement: Nutrition and athletic performance. Medicine and Science in Sports and Exercise. 32:2130-2145. Burke, L.M., Kiens, B., & Ivy, J.L. (2004). Carbohydrates and fat for training and recovery. Journal of Sports Science. 22, 15-30. Dreon D.M., Fernstrom H.A., Williams P.T., & Krauss R.M. (1999). A very low-fat diet is not associated with improved lipoprotein profiles in men with a predominance of large low-density lipoproteins. American Journal of Clinical Nutrition. 69, 411-418. Fleck, S.J. (1999). Periodized strength training: A critical review. Journal of Strength and Conditioning Research. 13, 82-89. Gibala, M.J. (2004). The role of protein in promoting recovery from exercise. Gatorade Sports Science Institute Sports Science News. Hawley J.A., Dennis S.C., Lindsay F.H., & Noakes T.D. (1995). Nutritional practices of athletes: are they suboptimal? Journal of Sport Sciences. 13, S75-S87. Lambert C.P., Frank L.L., & Evan W.J. (2004). Macronutrient considerations for the sport of bodybuilding. Sports Medicine. 34(5), 317-327. Marx, J.O., Ratamess, N.A., Nindl, B.C., Gotshalk, L.A., Volek, J.S., Dohi, K., Bush, J.A., Gomez, A.L., Mazzetti, S.A., Fleck, S.J. Hakkinen, K., Newton, R.U. & Kraemer, W.J. (2001). Low-volume circuit versus high-volume periodized resistance training in women. Medicine & Science Sports & Exercise. 33 (4), 635-643. Manore, M., Thompson, J. (2000). Sport nutrition for health and performance. Human Kinetics. Manore M., Thompson J, & Russo, M. (1993). Diet and exercise strategies of a world-class bodybuilder. International Journal of Sports Nutrition. 3, 76-86. Miller S.L., Tipton K.D., Chinkes D.L., Wolf S.E., & Wolfe R.R. (2003). Independent and combined effects of amino acids and glucose after resistance exercise. Medicine and Science in Sports and Exercise. 35, 449-455. Sherman W.M. (1995). Metabolism of sugar and physical performance. American Journal of Clinical Nutrition. 62 (suppl. ), 228S-241S. Overturf, R. & Kravitz, L. (2002). Circuit training vs periodized resistance training in women. IDEA Personal Trainer 13(10), 28-33. Tesch, P.A., Ploutz-Snyder, L.L, Ystrom, L., Castro, M.J., & Dudley, G.A. (1998). Skeletal muscle glycogen loss evoked by resistance exercise. Journal of Strength and Conditioning Research. 12, 67-73. Venkatraman JT, Pendergast DR. (2002) Effect of Dietary Intake on Immune Function in Athletes. Sports Medicine. 32(5):323-37.